This is a in-depth personal interview with one of my Armenian musical mentors, Jack Chalikian. I wrote a short blog about Jack in 2014 but this interview gives a great insight to Jack’s background, his influences and music. Paul Maranian (Scottsdale, AZ), who conducted and created this blog is featured as a guest in Hye Times which includes his transcript of the interview. It has been put together by Paul with the assistance of Harry Kezelian (Michigan) and Antranig Kzirian. (California) I commend these three gentlemen that took the time to sit and record Jack and you will also hear some rare recordings of Udi Hrant from Jack’s personal collection. Please enjoy and comment if you like this story. Jack Chalikian (b. 1940, New York City) is easily the most prolific American-born Armenian master of the kanon, or Middle Eastern zither, both in terms of recordings and live performances. 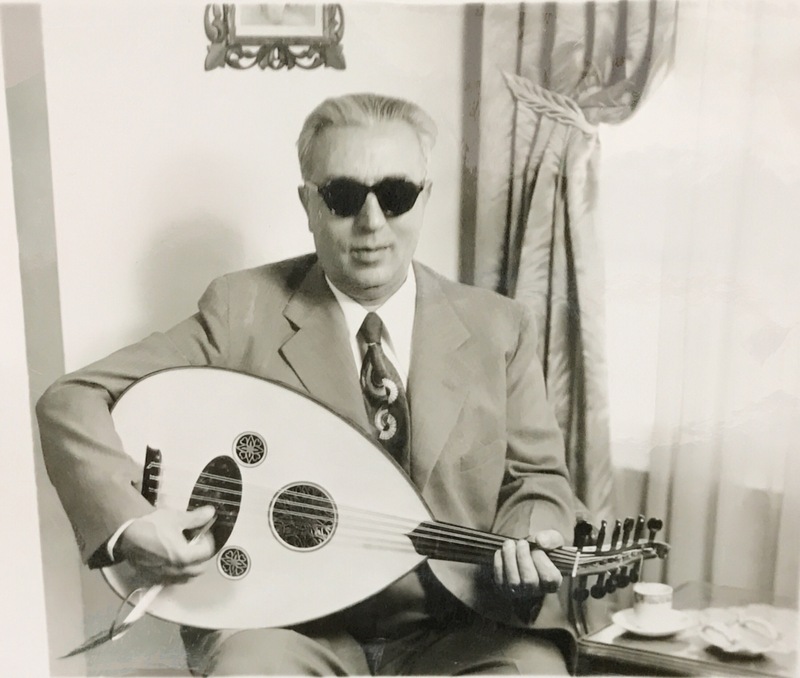 Born to Hovhannes and Knar Chalikian, Armenian immigrants from Adapazar, Jack grew up steeped in the musical culture of his parents and grandparents as well as the Armenian community at large. His repertoire, like most of his colleagues, ranged from Near Eastern Classical music of the Ottoman Era to Armenian folk music from both Anatolia and the Caucasus. His kanon playing, in the company of other American-born Armenian musicians of his generation, formed an integral part of the Armenian-American musical tradition that came to be a staple of Armenian social gatherings in the United States in the 20th century, flourishing in such areas as New England, Philadelphia, New York/New Jersey, Detroit, Chicago and Wisconsin, Fresno, California, and Los Angeles. Jack has performed at thousands of community events – dances, weddings, “kef times,” house parties and so on, from coast to coast for over 50+ years – including his notable participation in the “Armenian Day” performances at the 1964 and 1965 New York World’s Fairs. His kanon playing can be heard on numerous albums, most notably the Kef Time series also featuring oudist/vocalist Richard Hagopian and clarinetist Hachig Kazarian, as well oudist John Berberian’s first two albums, Expressions East (1964) and Oud Artistry (1965). Jack’s first album, Live At The Seventh Veil (1964) features Jack’s kanon paired with the oud and vocals of Richard Hagopian and the percussionist Tsolak Sanasarian. Jack was just 24 years of age when the album was recorded, four years after he first started learning the instrument, and the album has become a classic in the Armenian-American musical community. However it is perhaps as a member of the Original Kef Time Band that Jack is best known. Following the groundbreaking success of their albums, Kef Time Las Vegas (1968) and Kef Time Fresno (1969), recorded at one Vegas session, the band playing on those recordings was in high demand in the community, leading to an annual event, Kef Time Hartford, which brought Jack along with Richard Hagopian, Hachig Kazarian, and Buddy Sarkissian (percussion) to the East Coast on a yearly basis starting in 1971. Kef Time Hartford was followed by Kef Time Cape Cod which took place annually on the Fourth of July weekend for over 30 years as well. 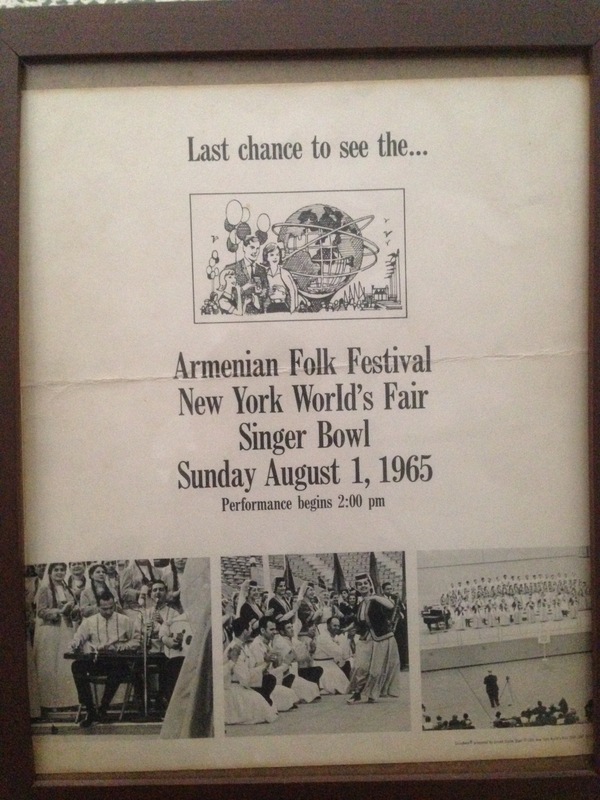 These weekend-long events featured a different Armenian band each night, but the Original Kef Time Band was the draw. Generations of Armenian-Americans met, mingled, and danced, all while appreciating the highest level of musical artistry stemming from the musical traditions of the early 20th-century Armenian immigrants to the United States. The albums Kef Time Detroit (1971) and Kef Time Hartford (1975) finished up the Kef Time Series on a high note. These albums can be found in the record collections of countless Armenian-American families and inspired the next generation of young budding Armenian-American musicians to take up the oud, clarinet, kanon, and dumbeg. Jack is a member of the Knights of Vartan – Sevan Lodge and St. Peter Armenian Church of Van Nuys, CA. He has been recognized for volunteering to teach high school students various aspects of jewelry-making as well as mentoring younger musicians in the Armenian-American musical tradition that he has been such an integral part of. JC: I was born in New York City, Columbia Medical Center. I think it’s 125th Street. My parents lived in Washington Heights at that time. Later we moved to Jackson Heights, Long Island, 1945… Actually, they lived in Astoria, where my sister was born. Then from Astoria to Jackson Heights, where I went to PS 152 until the age of 11, when the entire family moved to Los Angeles, California, the Wilshire area. I went to John Burroughs Junior High School, LA High. And for my father, in 1956, got together with a partner, we moved to Guadalajara, Mexico. 1956, 1957, 1958, almost three years we lived in Guadalajara. Then we came back and I started going to college at that time. And my grandparents came from Istanbul with the quota system right after World War II, my mother’s side. 1946, my mother’s parents. PM: When did your parents come here? JC: My father came first to the United States in 1938, and by 1939 he had moved his entire family from Paris. They migrated from Istanbul to Paris, the Chalikian family, in the early 1930s. And then, my father got the Chalikian family, his brother and sister and their family to the United States in 1938, 1939. And went back to Paris, and my grandmother brought my mother to Paris, and my father married my mother. And then brought her, to New York, and they lived in Washington Heights. PM: So where were your grandparents from? JC: Ok, on both sides, my mother’s side and my father’s side, were from Adapazar. All the families knew each other, of course. My grandfather in Adapazar was a jeweller. And my father of course became a jeweller, and his brother was also a jeweller. And my grandfather, also was a musician. He played flute and kanon. With a bunch of other Armenians..
JC: In Adapazar. So they would play every now and then for weddings and whatever, the way I understand. My grandfather, being a jeweller, always had money. The Chalikian side was very rich, they owned a lot of land, and horses, and stuff. And my grandfather would always go to Istanbul, take care of business, and then come back to Adapazar. Along with that he had a record player. And so he would always bring records. And somebody in Adapazar who used to enjoy listening to those records was Udi Hrant. JC: My grandfather would take Udi Hrant to church every Sunday. JC: I have no idea. A young kid. PM: Now did Udi Hrant have parents? JC: Yeah, yeah. The families knew each other. Udi Hrant, even in Istanbul, knew all of my grandmother’s sisters and brothers and whatever, so every time he would come to the US he would tell my mother, “your aunt is…told me this, and your whatchamacallit, and… their marriage and this and that, they had three kids”. They still knew each other family-wise even when he came to the United States. JC: Yes, my family also…was put in boxcars from Adapazar, and the first stop was in Konya, on to the desert. My grandfather was a jeweler, and the first thing he grabbed when they shoved him into the thing, he grabbed gold coins. This is why the Jews have always been in jewelry, or whatever, just in case they have to run. And he bribed a couple of the cops, or the soldiers, in Konya and they let the family out. And every night they would go and open up other boxcars letting out Armenians. My father said that the whirling dervish, what do you call them mevlanis, are a separate sect from being Moslem, and they helped a lot of Armenians also, out of the boxcars. I don’t know too much more about Udi Hrant, but I know that they eventually they let a lot of Armenians out, and they all went back to Adapazar, grabbed their stuff, and ran to Istanbul, that was a safe haven. And then from there they went to Paris. PM: Did your aunts and everything live near you guys in New York? JC: Actually what happened was…we lived in Astoria, my uncle had a candy factory. My father’s sister’s husband. It was known as Melkon Candy Company. He would make lokhum, hard candy, helva. And he was an excellent chef as well. And as I said, he also came from Adapazar. Originally from a community outside of Adapazar, I forget the name of the place, it’s on the seaport…it’s only about fifteen miles away. So anyway eventually they bought themselves a duplex, upstairs downstairs. So we lived upstairs in Jackson Heights, and my aunt, uncle, and the family lived downstairs. So we grew up basically as one family. Later my uncle had the Waverly Hotel up in the Catskills, and later on they opened up a restaurant in Greenwich Village known as The Dardanelles. JC: So you know, whenever there was a new recording or whatever, he would bring it to Adapazar and everybody would listen to it. That was the highlight. Not too many people had a phonograph at that time. My grandfather Chalikian died in Istanbul. My father came to Istanbul to take him finally to Paris with the rest of the family, but he died in Istanbul. PM: Do you know what area in Istanbul they lived in? JC: No….I know where my mother lived. Not too far from Taksim. And she went to Armenian school right in Taksim. PM: Do you know anything about the music in Adapazar? JC: No. Not having my grandfather Chalikian to tell me any of this stuff, and I never asked Hrant, who would have known. PM: But it sounds like Hrant learned music from all the records that your grandfather was bringing him. JC: I mean, my grandfather had a little collection. Hrant actually ended up in Istanbul, later went to Greece. He speaks fluent Greek. He learned over there in Greece. Oud. Because Udi Hrant played violin. It wasn’t until he went to Greece, that he studied under I forget the person’s name. Richard [Hagopian] would know. In fact there’s a recording, 78 recording, of Hrant’s teacher, which is a phenomenal oudist. PM: So you’re saying Hrant learned a lot of oud playing in Greece. Was the teacher Greek? JC: I don’t know. I would think he’s either Turk or Armenian. PM: What do you remember about community life in New York. JC: It was very, very, close, because don’t forget the Armenians were still a handful. Most of them had just come out of…Everybody was very tightly knit, with the Armenian church and affairs that are going on. It’s not like Los Angeles where you have a half a million. I think the population there was much smaller. There was a group of people like my father, who were brought up with this music in the household, who always bought the records. And they would always show up for different organizations…Just about every group of Armenians, including the Adapazartsis, had a group. PM: What were some of those? JC: Well, you had the…oh…you name some of the larger towns…Gesaratsis [Armenians from Kayseri/Gesaria] and this and that. You had them having their own little banquets and everything else, aside from AGBU and some of the other things. JC: Yeah. There was a radio program in New York, at 5:30 on Saturdays. There was an international station over there, and every half hour it would change from Italian to Armenian to something else. And the person who was in charge of that was a woman by the name of Diana Sarkis, so you would always get all the information as to another church function, or another dance or whatever. She was sort of like the glue for the Armenian community over there. PM: Ok, so obviously you were too young to go to a nightclub, but what can you tell us about that. JC: The nightclubs per se, there was no such thing as an Armenian nightclub. But you had Armenian restaurants, about six or seven of them. JC: Downtown, Midtown, most of them Downtown. Along with that, if you wanted any music you would go down to what we call, what was known as Greektown. Greektown was basically where you had five, six different clubs, drinking bars whatever, which had music. JC: Right. And what would happen here would be, you would have parts of the band playing Turkish music, parts of the band playing Greek music. So if you were sitting down, you wanted to hear some Greek, throw a couple of bucks on the stage and the Greek musicians would play. And the Armenians would sit down and play along with them. And then turn around and then you would hear Turkish music. I mean no one sings Armenian, still today. But you had the same situation going on in Boston. And one of the top places over there was where you had Marko Melkon playing almost every night, with his group. And I will tell you the Boston people are closer to their music, because the Boston community was… still today, the Boston community is the type that would…they all run to any place that has music. If they find out Harry Minassian is playing somewhere, still today, the word gets out and they all show up. That’s not happening… New York, Greektown folded up, they tore down all those things and built condominiums in that area. But in Boston, there’s still quite a lively group of people that show up. PM: So when you go to let’s say Port Said, or Egyptian Gardens, what’s the clientele there? Who’s going there, is it mostly Armenians? Or is it a mix? JC: Mix. Greeks, some Armenians, whatever. PM: So they’re all in the same restaurant together. JC: See now things have changed. The Turkish group of people have moved down to Brooklyn. And you got a lot of Turkish restaurants there, and Turkish music. Lotta Turks. PM: So that’s interesting. You’re saying the clientele would have been Greek and Armenian, but, there would have been Turkish music. So the musicians and singers would sing in Turkish. JC: Well, don’t forget the Armenians came from Turkey. JC: No, no, no, no. But what happens though, for instance, you go into two record places to buy records. One is Prodromidis on 8th Avenue, and another one was H.M. Tashjian, to buy records. And you would not be able to find any “Armenian records” not until 1950, 1951, when the Soviet Union started stamping some records from Armenia. So you would always have local talent singing Armenian music. And the same with Turkish music. But there would be more recordings from Turkey there than Armenian, until 1950 when a revolution sort of started, and Armenian music started to infiltrate the U.S.
PM: Let’s talk about your father. He was one of the people responsible for bringing Hrant over? JC: Well Hrant came the first time with somebody who wanted to bring him here to see if medical science could possibly help him with his eyesight. And it turned out that his situation was too far gone for any recovery. But then a lot Armenians started to gather around him, for the fact that this was right after World War II, and the Armenians had plenty of money in their pockets. And he was sort of like, a person who is going to now play the music that these people hadn’t heard for a long time. He was sort of like an icon, that the Turks respected him. Don’t forget there weren’t too many people recognized as an Armenian, that the Turks would recognize. So he became sort of like an icon, and at the same time he started playing music that a lot of the Armenians who had left Turkey… sort of like, he brought back to them… Just a handful, like my father and everybody else, who grew up with this music. They were looking forward to hearing this music. And it was safe for the fact that he was an Armenian, he wasn’t a Turk. PM: Where did he go around performing, some of the clubs? JC: Yeah, he played the clubs, and my uncle had him playing at [his] hotel. All according to…because his visa would have him stay for about six months or eight months. And then he would go back again, and then come back again two years later or whatever. PM: You’re saying he was like an icon, almost like a celebrity, for the Armenians in New York. Did he like that status? JC: Oh of course. Don’t forget when he went back to Istanbul, he was…nothing, for him over there. He was Udi Hrant and that was it. He couldn’t play on the recordings, for the fact that in the 30s and 40s and 50s they all played with notes. We’re talking about Şukru [Tunar], Kanuni Ahmet, and everything else. And Hrant could not read notes, so he would not be a regular as far as the orchestras go. He didn’t do any nightclubbing or anything else. These were all professional musicians sitting down playing note for note. Oh and by the way, Udi Hrant’s favorite music was tango! When he came to our house he would ask us to put on tango music and he would enjoy listening to it with a glass of scotch. PM: So going back to what you said earlier, the Soviet Armenian stuff starting coming in, you said, in the early 1950s. Would you say the music changed after that? JC: A lot of the music recorded by the young Armenian groups were folk songs that the parents had brought from Turkey. I mean here you had another component. What we were used to hearing, the old Turkish records over and over again, there was nothing new. Here you had something new as far as Armenian music goes. And what happens is, you start to have some bands start up. This was now the kids of the parents, the ones who came to the United States. One would be known as the Vosbikians, from Philadelphia. In the early 50s, they started coming out with about ten records, five to ten records. And then it was the Vosbikians, then 1956, 1957, the Gomidas, you had Harry Minassian’s group, the Orientales up in New England. Slowly but surely, these groups, would start to play for the Armenian dances. And they didn’t perform Turkish music – they performed Armenian music, from their recordings. So there was a little transition there, from 8th Avenue, and nightclubbing, to now home-grown Armenians playing music. PM: And how do you think were they learning this music? JC: Because the parents never spoke English, the parents always spoke Armenian. And basically they would always listen.. there were always local 78 records made by…Soode Soode, this and that. These were records played at the house, so these guys would all get together and the parents would say “This is a song that we used sing, this is a song we used to sing”, and that’s how some of that music started. But remember I was out on the West Coast and there was a lot more going on on the East Coast that I was not exposed to. PM: So let’s move on to your playing a little bit, you learning how to play the kanon. How did you get started with that and who were the first musicians you played with. JC: Actually, I had heard so much of this music, prior to me playing the kanon. And my father was always asking me, “Hrant is coming, he wants to know if you wanted anything”. And my father was sort of like always pushing me to get a kanon. Why, because my grandfather played kanon. And I used to dabble a little on the piano, by ear. So I said, alright, and 1960, Hrant came, and I got a hold of a kanon, the one I still play today. By that time, I was going to school, to college. And there was no one to teach me, so I tuned the instrument to piano A just like you would tune a piano. And there was one person that played kanon, once, I had seen, his name was Allan Jendian. He was playing with a local band for Armenian dances, the Barrites. And he was playing the kanon once. So I asked him, “how do you tune it”, and he says “oh, I tune it this way”. Then later he moved up to Fresno, so I never saw him again. He married Rosemary. But I mean we were all active in the ACYO. And it wasn’t until I started dabbling on the kanon…Of course I had all of this music that my father had accumulated. My father had a tape recorder, so we constantly had recordings of Udi Hrant, Turkish, Arabic…. JC: No, in the house. I still have them. Make a long story short, all this music constantly he would ask me, alright turn on the tape recorder, turn on the records this and that. I mean there were tons of records. And then my grandmother, when she came in 1947, 1948, from Istanbul, my father had given my grandmother money to bring back records, so she brought back around 200 Turkish records. And that was a goldmine for my father, you know. JC: Well playing them for my father of course I would hear it. But I had no other channel to get it out. And it wasn’t until 1961, I met Richard [Hagopian]. And actually I had seen Allan, and I had a tape here from my father’s friends. My father’s friends would always send a tape to my father, over here, and they had some recordings from Istanbul. So I put them together, and I figured Richard would like to hear it. JC: Yorgo Bacanos, Şukru Tunar, Kemani Nubar…some classical stuff. And I gave them to Richard. Then Richard was playing here with a couple people, and we got together at a house party at the Jebejians. He says “why don’t you bring your kanon”. And I said “well I’m just learning”. And he says “oh that’s okay, just bring it”. So after that, he says, whenever you’re in the Fresno area, come over. So whenever I’d go up there, we’d get together and start doing the same thing I was doing with you, let’s learn some of the classics. And as I’m learning the classics, I’m also learning the instrument. PM: So why don’t you explain what you mean by “the classics”. JC: Classics are the Turkish and Arabic preludes to a more formal musical program. They are known as [saz] semais, which are a different tempo, and peşrevs, which is a 4/4 prelude. These would be written by a number of people, including Armenians and Greeks, which are still held today as masterpieces within the musician community. JC: Yeah. I learned a lot from Richard. I would stop off at his house. For a number of years we’d sit down and knock off about an hour or two. And his doors were always open. PM: So this is I’m guessing the early 60s. JC: Early 60s. ‘61, ‘62, ‘63. JC: Yeah I think that was the first recording we ever made. About 1964. PM: Did you have an ongoing gig at the Seventh Veil with Richard? JC: No, the person who owned the Seventh Veil restaurant wanted to make a record. And Richard asked me to do it with him. And we recorded that record a block away, on Sunset Boulevard, where the Oldies but Goodies album with Art Laboe was. And Art Laboe was an Armenian. So it worked out very well. Had a chance to meet Art Laboe. PM: But wasn’t 1964 also the World’s Fair…. JC: Yeah. We went to New York, our family went to New York, twice, during the summer. And that’s how I got into the World’s Fair. JC: Well, you got a kanon, hey, come on…They were all musicians anyway. Why don’t you bring it over and we’ll go for some rehearsals and whatever. JC: John was in the second World’s Fair, which is when he met Onnik Dinkjian for the first time. PM: So how did you meet those guys then. JC: I knew George [Mgrdichian] when he was 19 years old. 1955 I was a bellboy at my uncle’s hotel. George was 19 years old. He played oud with Udi Hrant in the hotel, he was there for the whole summer. We grew up together. PM: So are you saying he performed with Hrant? JC: With Hrant, yeah. I have tapes of that. And my mother was there also, for the summer, my sister, my mother and myself. My father was in LA of course, he was working. PM: So were you going back there every summer? PM: Were you flying back then, or was it driving. JC: I’ve taken the bus there. We’ve taken the train there. We’ve taken the car there. Don’t forget we grew up together in the same house. My uncle who owns the hotel, was also the candy maker. And they also had a restaurant in New York, known as the Dardanelles. PM: This is your uncle. What was his name? JC: John Ohanessian, also known as Melkon Ohanessian. This is my father’s sister’s husband. PM: It seems like a lot of musicians met at his hotel. Was that the only hotel where there was music? PM: …Who was that, Steve Bogosian? PM: So tell us a little more about the World’s Fair. What music did you play? PM: Were you playing the nightclub music? JC: No, no, no, no, no, this is the choral singing and dancing. JC: Hayastantsi, right. And the second time, John came. I had met John [Berberian] at my uncle’s hotel. I had a job over here in LA, I was working here, but I went over there for the Labor Day weekend. And my sister and mother had been in the hotel. And John had been playing over there for the entire summer. So I met John there Labor Day weekend. And the following year we played again for the World’s Fair, we played two years. And at that time I introduced John to Onnik [Dinkjian]. Because Onnik was saying to me, “oh what am I gonna do now that you and John Valentine are…” because John and I used to play Armenian music, and Onnik liked to sing along with us. So I introduced [Onnik] to John saying here’s the guy who’s gonna… get together with, Onnik. And they got together, and you see what’s been happening. PM: So how did you meet Onnik for the first time. PM: So what about the Kef Time albums. How did those get started..
JC: The person, his name was Harrison, of the Riviera Hotel [in Las Vegas]. One of four partners of the Riviera Hotel, and he was Armenian. He told Richard he would front Richard the money for an album if he played Soode Soode. [laughs] So that was our…the first album we made, Kef Time Las Vegas, first cut was Soode Soode, for Harrison. PM: Where’d you record those. JC: In Las Vegas. What happened was, Harrison gave us a big banquet hall room, with a waiter, and he says “you take care of these guys”. In other words, anything we wanted, the waiter would go back and forth and give us. And we rehearsed over there. So we did that, and then a year later we did Kef Time Fresno. Then we recorded Kef Time Hartford, in the Boston area, along with Kef Time Detroit. We recorded two albums I think at the same time. But we were now going back and forth playing all the time. When we played in Hartford, that was a big…The Kef Time Band was identified with Hartford. And it was a big to-do. You should have seen the crowd, thousands. The first time we played there was over a thousand people. PM: So the Cape Cod and Hartford kefs, how did those start and when did they start. JC: Well they were friends of Buddy. They approached Buddy, and Buddy approached Richard. PM: So how often were you travelling back east back then. JC: About three, four times a year. PM: There’s a recording of Richard [Hagopian] playing with Chick [Ganimian], were you on there? JC: Yup, that was my tape, I made that. JC: Oh this was at Andy Nalbandian’s house, out in La Crescenta. There was Baron Avakian, he got all of the old-timers including my father and whatever, and he wanted everybody to have a nice kef party at his house. AK: It’s a great recording. JC: There wasn’t much and there wasn’t a big crowd scene to go to. JC: I learned the 10/8s more from the records…. JC: Right, Istanbul is more the şarkıs. Armenians were singing these songs a long time ago, hundreds of years ago. Richard learned them from the musicians in Fresno, and he wanted to put some of these on the Kef Time albums. Tatyos was considered the top, one of the top violinists for one of the sultans, who was a great devotee of Turkish music. And Tatyos almost spat on him for the fact of what he was doing to the Armenians. And some of the stuff he told the sultan would have had other people’s heads chopped off but….[chuckles]. Tatyos was the type of person that would play, and then he was a devout Christian. So he would put his shabig on and run to church. PM: But to sing presumably, he wouldn’t be playing the violin. JC: No, no. Maybe as a sargavak. PM: What about Artaki Candan [Artaki Terziyan]. PM: That was a record label. JC: His Master’s Voice, right. RCA. His knowledge of the music was profound. If you ever have a chance to listen to his kanon things, he’s got different techniques that he does on the kanon. PM: Was he a model for your playing. JC: Not necessarily. My model for playing was that of Kanuni Ahmet [Yatman]. If Ahmet was on stage, he would get up and hand the kanon to Artaki and kiss his hand. PM: Was he a student of Artaki. JC: Maybe, maybe not. But in respect. That’s how it’s done over there. JC: Kemani Nubar was a violinist. Profound. Number one. You don’t get the word kemani, or udi, or kanuni, unless it’s established by the musical college over there. You are outstanding. He was not very much liked by the Armenians. In other words he wasn’t very close with the Armenian community. But until he died he was considered one of the top violinists. Especially with the…when you get the word kemani or whatever it’s because of your understanding of the taksim. Still with the jazz greats today, you develop a name because of the way you play your solos. You’re judged by your solos. It was the same thing with Nubar. PM: Did he ever come to the US. JC: …is bacanak [brother-in-law] to Udi Hrant. That’s all I know about him. He never did anything, except he was able to make a couple of records for Balkan Records. And one of them was Parov Yegar Sirun Yar. PM: That was his song, he wrote that. So he didn’t perform with Hrant. JC: Not that I know of. He was also blind. Could see very…a little. But don’t forget even Hrant couldn’t get a living, and he had a name. These guys were able to play in the coffeehouse or something, and that was it. JC: I didn’t have any [contact]. Richard had a lot of contact with Kanuni Garbis, they were semi-related family-wise. But Kanuni Garbis taught Richard a lot about music and the makams, and whatever. He was mostly retired, Kanuni Garbis – when I picked up the kanon, I had no knowledge of Kanuni Garbis, he was in his 80s already. And there was another kanonist, Ara Sevanian, who played Armenian kanon, very fluttery, with no Turkish or anything. It was a different…. I helped him fix his kanon a couple of times, but there wasn’t much that I felt he could offer me. AK: Ok, this one relates to the oud. Could you give me a little bit of your insight on the different oud players, their styles, their influences, what their careers were like, what their influence was on the next generation? Just kind of about them. JC: The ones that I know, needless to say. I know George Mgrdichian, Chick Ganimian, John Berberian, Richard Hagopian, Harry Minassian… Those are the more familiar ones. There’s also Joe Kouyoumjian. Joe I think is the most underrated of all the oudists. But these are just the few that I’ve met, there are many other oud players that I have not met. JC: Huge drive. I mean… George had his own concept of oud. If you were to ask me, who technically is good on the oud. There are several. George, Richard, Harry Minassian. Kouyoumjian I’d throw in there. Of course Berberian. Those are the 5, or maybe one more which later might come to mind. Those are the ones that, have somewhat mastered the instrument as far as I’m concerned… of what I’ve heard. George had his own concept… and he held onto it. AK: He was from Philadelphia? JC: With his brother… the Gomidas band. JC: But as far as with George, he held onto exactly what he did with the… I have live recordings over here he had a concert in LA. So his was very European. Chording… whatever. As Hachig [Kazarian] says, a lot of people didn’t know that the oud could be played with chords. And George did the chording. AK: And he went to Julliard for clarinet right? AK: So he was a very accomplished musician. JC: He was an accomplished musician. Of course Hachig [Kazarian] had his masters from Julliard. But we’re talking about oud now. Chick had his own concept of oud… music in general. And he tried to introduce rhythms and jazz… …and he heard music a little differently… outside the box. And that went great for a while. Unfortunately alcoholism killed him. JC: It wasn’t the 8th Avenue… he was able to for a number of years, I forget the name of this club… …high rent district. AK: Really? And it was also a trend in that time? The Middle Eastern music scene was peaking… people liked it. AK: That was the hot spot. JC: So, that was that. Chick came out with an album on the Atco label. “Come With Me” or something. I have it here. He had Onnik sing on there. In fact one of the songs that Onnik sang on that album hit #10 on the charts in New York. AK: What song? Do you remember what song it was? AK: (Laughter) That is incredible. JC: And he sang it in English. AK: Yes I’ve heard that. JC: Like “Come On A My House”. JC: So, anyway. But Chick was fast on the oud. Very… …he caught your attention. AK: From what I’ve heard. He was very… he had an aggressive style. It would kind of be aggressive one second. And then kind of frantically calm, and then back to pushing it. JC: He drove drummers insane. JC: It was a little outside the box. JC: Knowing Richard for all these years I believe he has a vast knowledge of our music, both from the villages as well as the classical side. Richard – standard. The standard with the Armenian… His knowledge of a lot of this music is far superior than most other musicians that I’ve known. AK: I did a research project on a lot of this kind of stuff. And the material that I was able to uncover when I was interviewing oud players was limited because of my time schedule in grad school, so I was able to interview John, Ara, Mal and some of the younger guys that I grew up with so I got some generational perspective but it was not comprehensive. For example, I hadn’t really spoken to you yet. I was in New York so it wasn’t practical to see Richard. But that’s a very good point and I agree with you. AK: A lot of knowledge. AK: So Richard’s style – how would you describe it? Kind of like the folk traditional? JC: He is the traditional… Note for note, inside the box. AK: You were saying Harry. JC: Harry Minassian also within the box. He’s got the New England sound with the guitar and the oud. He presented that the first time… …Berberian liked that style. AK: He liked that. Basically adding chords, it added color. Playing a rhythm chord. JC: John sent me a tape with the two of them, guitar and oud, just the two of them together. I have that if you’d like it. AK: So John Vartan and John Berberian. JC: The New England sound you called it. AK: So Harry was the originator of that. Was that with Jack Zarzatian or Ken Kalajian – those guys? JC: All those… Kenny Kalajian… That whole box right there is represented with Harry Minassian. And – you wanted the Turko? He played the Turko. He was… he was there to entertain the people. And the New England people are different than anything else. They go crazy for their music… …still today. If the word gets out that Harry is playing somewhere. JC: Found out last year… somebody said Harry is playing somewhere. Within a couple of hours that place was full. AK: Because they like what he plays. AK: To be honest, not that I have bias… but when I was growing up in Philly. It was similar to that. Between the Mgrdichians and the Vosbikians and the Hoplamazians, there’s a lot of musical tradition there. So it was similar… if there was a kef or a party or cape, or this that, Philly would… everybody would go. JC: Although I know the Hoplamazians very well because they played up at the Catskills. AK: Yeah, there’s a lot of musical families. JC: I know Jack. I know Jack’s son. JC: I held David when he was about 6 months old. AK: He’s a very good friend of mine. We just performed together a few months ago. I’m going to call him and tell him this. JC: I was at Jack’s house, he says here’s my son. AK: David is a very talented violin player, and he plays the oud too very well. JC: Unfortunately I’ve not been able to get to Philadelphia. AK: I think Jack makes oud, he actually builds them. And he’s a good oud player. JC: He’s in construction too. JC: George… Richard… Here on the west coast aside from Richard there’s nothing. Oh… John Bilezikjian. AK: He passed away earlier this year. JC: John… …very fast fingers. Played the oud fast, that’s all I can say about him. AK: To me I heard… I had a chance to study with him when I moved to southern California. To me, he was in some ways a little bit like George Mgrdichian. He was progressive. AK: Chording… It was just his style, he was phenomenal at what he did. Any thoughts on John Berberian? JC: John… Like a clock could swing from very traditional to very outside the box. AK: It’s inherent. Once you told me that John’s father was a musician and a maker, a luthier… …or he repaired them? AK: Kerestejian is a maker from…? JC: The maker of the oud. JC: I guess… I have no idea. AK: But it’s not from the states… Because I know John Merdjanian, Viken Najarian, and Kyvelos… they’re based in the states. JC: I don’t know if it’s Armenian or Turkish or whatever… But that was John’s oud. The Kerestejian. AK: Because he did have a very unique sound in the recordings. I chalk it up to, like you said, he was able to record as specifically as he wanted. JC: Also he was a violinist first. Richard was also a violinist first. And aside from… And John’s father would always give him an oud to play with for a week to break it in before they give it back to the owner to see if it works. This is where John gets to play all of these ouds and is very familiar with all of them no matter what. AK: He’s a phenomenal player. JC: Right because of his father handing him these ouds… work it out. AK: He’s very fluid, very knowledgeable. AK: Interesting… Ok… thank you Jack. JC: Armenian music changed a lot in the 1950s and 1960s with the influence of Soviet Armenia and Armenia today. I was very lucky to have the opportunity to know Richard, Hachig, and John for the short period that I was on the East Coast with the Kef Time band. Richard and Gerry Hagopian were extremely gracious to me always with the door open. Richard helped me out a lot with the music, and still today I consider him a very close and dear friend, along with another person I met through John Berberian, and that is Hachig Kazarian. I have also had some dear friends like Peter Kyvelos and John Valentine. There is a lot of talent today coming out which is continuing to carry forward our tradition of music. I hope this might have been a little help to share what I know. Top row: Roger Derderian, Ken Kalajian, Al Perch. 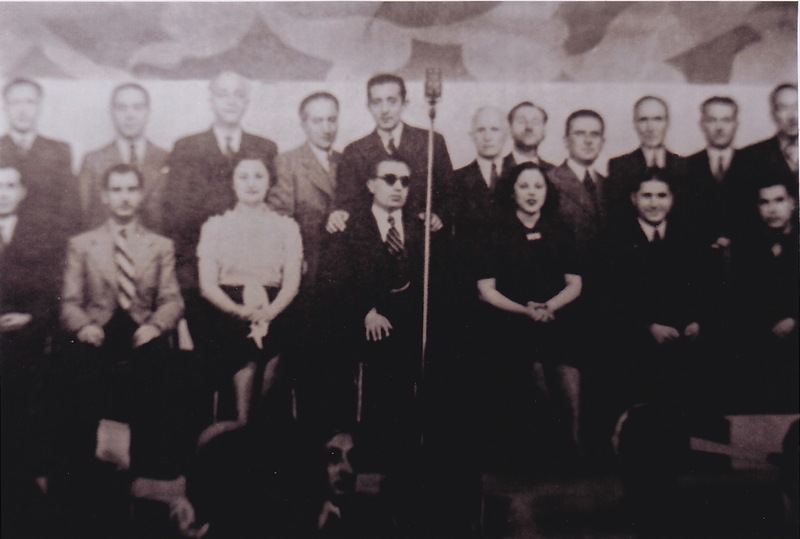 3rd Row: Hachig Kazarian, Harry Minassian, Jack Baghsarian, unknown. 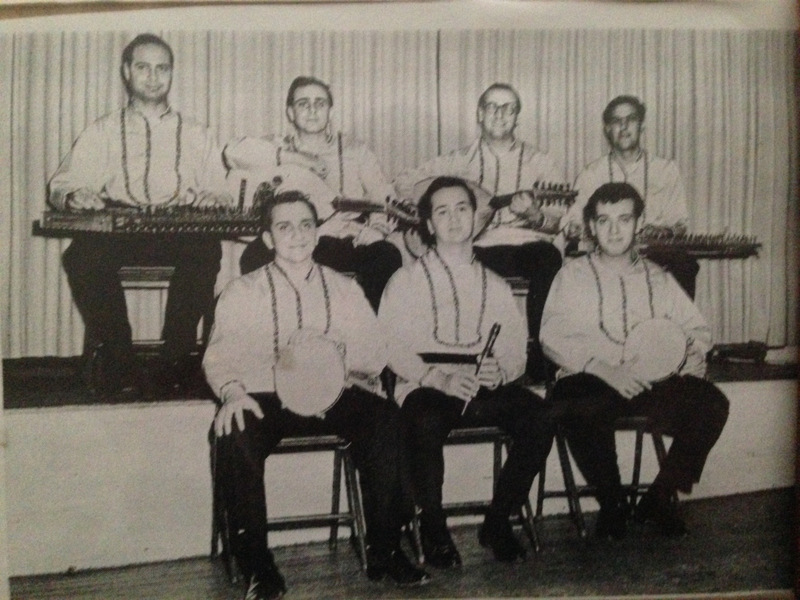 2nd Row: Jack Chalikian, Zaven Donabedian, John Berberian, Joe Kouyoumjian, Roger Krikorian. 4th Row: Bob Rafaelian, John Harotian, Richard Berberian, Greg Janian. with Armenian singer (tenor) Hovaness Badalian. Badalian said he’s a Mushetsi. This entry was posted in Armenian, music, Uncategorized. Bookmark the permalink. Thanks Mal! I made the correction. Hi guys, This is Harold Hagopian, son of Richard Hagopian. What a nice interview with JC. The ud and clarinet often get all of the attention so hearing stories from a kanunist’s perspective was a very good idea. Jack has been in my life since I was born and when he visited from LA, I was always happy, because I knew there would be a house party. Only people who liked listening music would be invited which meant that mostly they were older people. My dad and Jack played unamplified, so you could hear the beauty of the acoustic instruments. Kanuni Garbis often stayed with us so I saw lots of kanun playing and when I was 5 years old Kanuni Garbis put me on his lap and I even got to pluck a note on the kanun! That was a big deal for me. Anyway, Jack was a major figure in my childhood as was Uncle Hachig Kazarian, since the Kef Time band was booming then so these guys would stay with us before or after gigs and I’m sure that I annoyed them with endless questions! (especially poor Uncle Hachig) Thank you again for doing the interview. One last thing for all of you who have this music in your blood and love it as much as you can love anything….what must seem like little tidbits of nothing to “normal people” are little golden nuggets to people who think about this music, since very little is ever published about the people who play it. I have a tidbit to share. It turns out Sukru Tunar did come to America! In 1949. He did not play in the clubs, as Jack pointed out….no one would have appreciated his artistry there. He played in Town Hall and even made a recording which was never published. He recorded his song “Derdimi Hicranimi.” I had the chance to interview Sukru’s daughter who showed me the record. I hope Jack enjoys this one tiny story, as much as I enjoyed the hundreds of stories and times Jack shared with me and my family. Thank you Ara T for publishing Paul, Antranig and Harry’s interview! Thanks Harold, nice to hear from you. I agree that it was great to hear stories from Jack’s perspective.